Too Many Games is a small-ish video game convention that's apparently been around for quite some time, although I only found out about it three years ago. It's been expanding considerably, having moved from the almost-in-the-middle-of-nowhere location of Reading, PA to the slightly more suburban Oaks, PA, which is fairly close to Philadelphia. Rather than running a single day as in conventions past, this year's ran for three days...kinda. Friday was only available if you ordered a weekend pass, and since Sunday (today) is Mother's Day, I can't imagine too many people would show up. 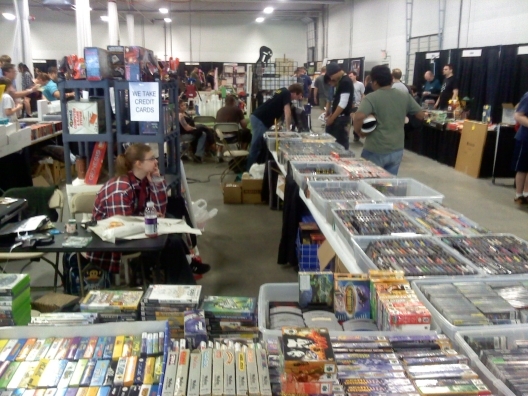 The crux of Too Many Games is still the dealers' room, which has tons upon tons of stuff for sale. As is typical of places aimed towards collectors, it can get pricey, although you can find some deals if you look. 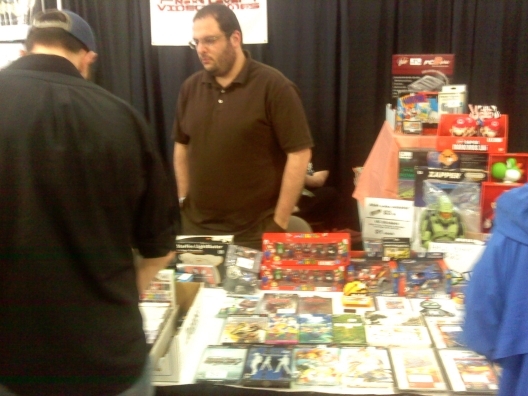 These guys were awesome, they had a ton of Japanese titles for reasonable prices. 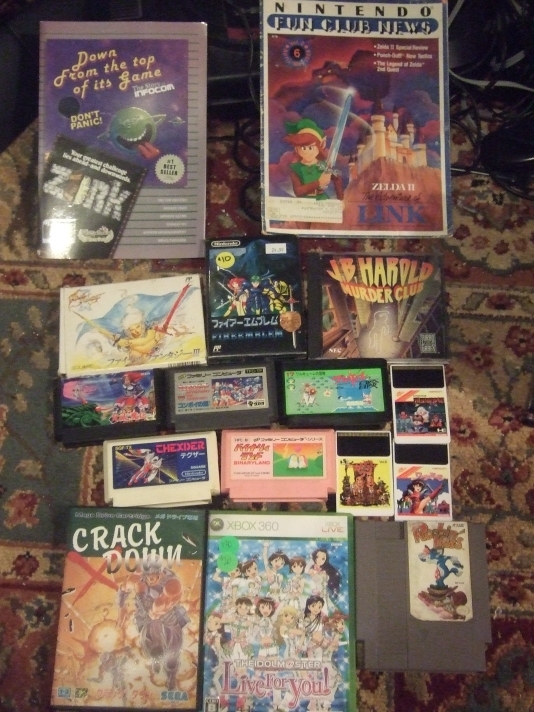 I almost grabbed that complete copy of Popful Mail for the SFC but ran out of cash. Apparently they are called Lucky Funtime Video Games and set up shop on the weekends at the Wind Gap Flea Market in Wind Cap, PA. They are worth checking out. 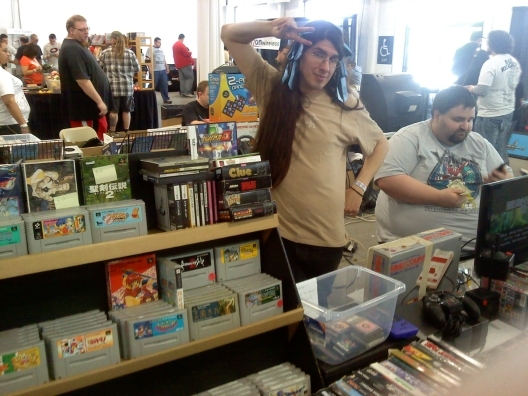 This is the stand of Next Level Video Games, which runs a store in Blackwood, NJ. It's an excellent place, definitely one of the best in New Jersey. They also run the recently launched Mech Taco. I also took a picture of the Mad Gear booth but it came out terrible. If you've ever been to a convention, you've probably seen these guys around - they have tons and tons of excellent import stuff in fantastic condition. I saw some guy walk away with a complete copy of Metal Gear for the MSX. It was $200, sure, but it's a helluva collectors item. They have a website, but you can probably find more on their eBay store. Last year at Too Many Games introduced some concerts, but they were just on a separate part of the show floor. 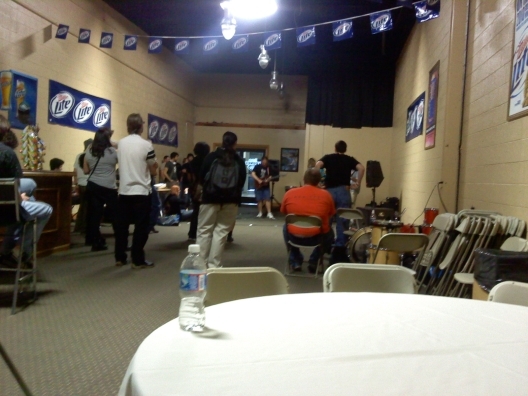 In this year's larger venue, they had the whole "bar" to themselves. I only sat in on one and I forget their names, but they did a fantastic rendition of the ending theme to Journey to Silius. 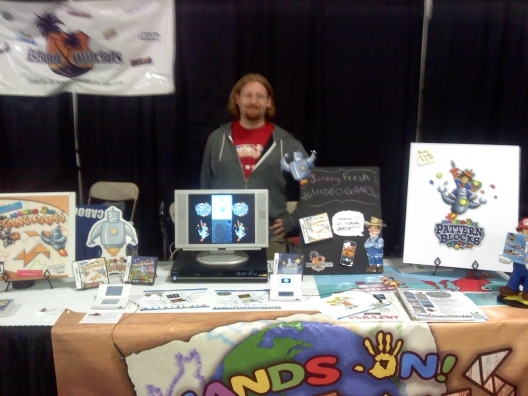 There were a few indie developers there too, this one being Island Officials, who made the DS games Hands On! Tangrams. 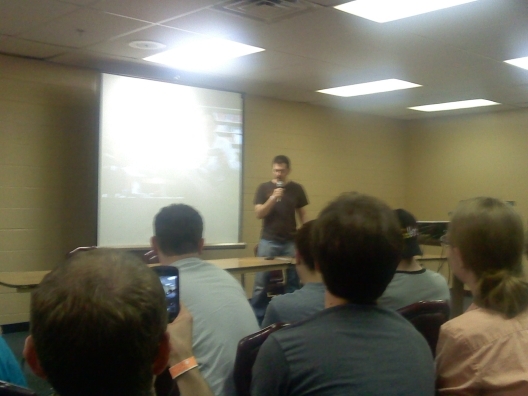 A few other companies were demoing their iOS and Xbox Indies games. The main guest was the Angry Video Game Nerd, who showed one of his more recent episodes, then took some questions and signed some autographs. I had picked up a copy of the awful Transformers Famicom game on a whim and thought it would make good signing material (did he ever cover that? I think he did) but the line was just way too long and it was approaching dinner time. And here's my haul. I haven't been collecting anything specific in awhile other than just grabbing cheap stuff. (Of course, it doesn't end up so cheap after cleaning out the local Gamestops of their decent GBA games during a sale a few weeks back...) At any rate, nothing I bought was more than $10 each. There's a copy of Down from the Top of its Game: The Story of Infocom, a book which deserves a write-up in a later post, and an issue of the Nintendo Fun Club, the precursor to Nintendo Power. I got a lot of Famicom stuff, including boxed copies of Final Fantasy III and Fire Emblem Gaiden ($10 each), that Transformers famicom game and Konami's Getsufuu Maden ($5 each), and Binary Land, Thexder and Legend of Valkyrie for a total combined price of $10. JB Harold was an impulse purchase from Mad Gear just because it's a fairly prolific Japanease adventure series (or so says Japan Adventure Attack, and was, again, $10. There are a couple looses Japanese HuCards, including Yokai Dochuuki, Wonder Momo and Kato and Ken, plus a beaten up copy of Rockin' Kats for the NES ($3 each for the PCE games, $5 for Rockin Kats). The boxed copy of Crackdown for the Mega Drive was $5, and that copy of Idolmaster: Live for You (which I think is the rhythm game?) was free with some other stuff I bought. There was some vague talk on the show floor of this possibly being the last show...the folks behind it are obviously trying to grow it, but they aren't quite sure if the attendence is improving enough. It would help if it were in more of a populated area - I would think northern New Jersey, closer to NYC, would be better (though maybe I'm biased since it would probably mean a shorter drive for me.) Still, I hope it continues. I wish I knew about this earlier! Oaks is like a half an hour from my house. I'll bookmark it and be sure to check it out next year. If the AVGN is back I'll try to get him to autograph a copy of Castlevania 2. Muwahahaha! And I don't see this Metal Gear you bought shown! Someone else bought Metal Gear. This sounds like exactly the kind of thing I'd like to go to, even though my import knowledge seems to get smaller and smaller as I realize how much is out there. I know the regular Idolmaster games are "make your own" pop star games, but I thought this particular one was a rhythm game. I guess I'll find out eventually - "free" is too good a price to pass up even if it's something I'll have to stick way in the back of my shelf. I wish stuff like this went down near where I live. Unfortunately, being in the middle of nowhere isn't overly conducive to finding these kinds of things. Interesting haul. I especially like the pickup of Rockin' Kats. That's one that I wouldn't mind getting at some point. Go to Magfest, it is great: huge and free arcade, and plenty of sellers like Mad Gear. Pretty sure the only Idolm@ster rhythm game is on the PSP. Some of those games look awfully familiar.. :) Thanks for the plug! As for the rumor this might be the last TMG... I hope that's just something somebody sighed about on a whim. This was my second TMG as a vendor, and my third TMG as a person, and it's improved by leaps and bounds every year. 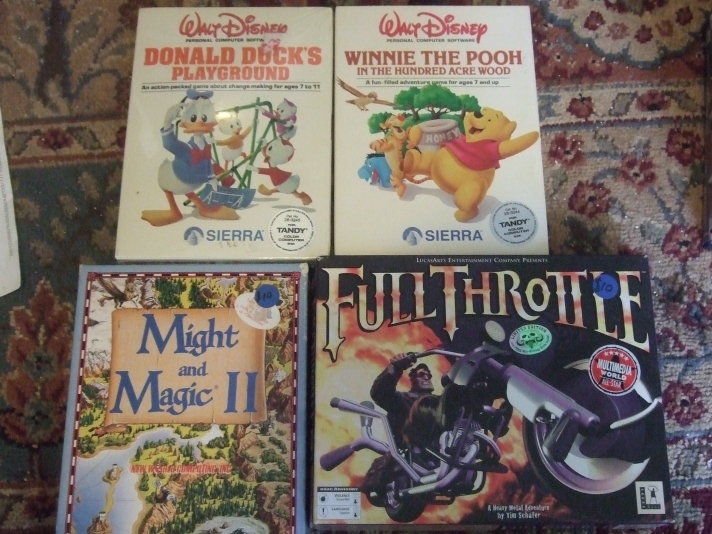 I am looking for Physical copies of "IBM PC/PCjr" versions of the following Sierra games to buy: "Troll's Tale," "Dragon's Keep," "Mickey's Space Adventure," and "Winnie the Pooh in the Hundred Acre Wood." Could someone let me know if anyone comes across these for sale?